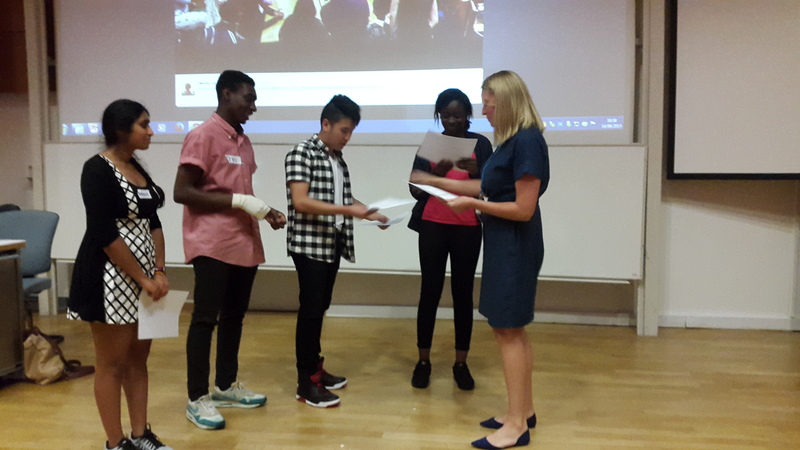 King's Health Partners Biomedical Research Summer School | Hosted by the Biomedical Research Centre at Guy's and St Thomas' NHS Foundation Trust and King's Health Partners Widening Participation Programme. Funded by Health Education South London. Hosted by the Biomedical Research Centre at Guy's and St Thomas' NHS Foundation Trust and King's Health Partners Widening Participation Programme. Funded by Health Education South London. Applications for 2016 are now open!! In 2016, the summer school will take 30 participants and eligible applications will be judged by a review panel made up of researchers from King’s Health Partners and organisers of the summer school. The review panel will be looking for student interest and potential. Successful applicants will be informed by email in July 2016. The summer school is offered free of charge to successful applicants and will run Monday 1st August to Friday 5th August 2016. 2015 KHP Biomedical Research Summer School students! In year or 10 11 for the academic year 2015/2016. Predicted at least 5 A*-B grades at GCSE (or subject to exceptional extenuating circumstances). Sessions will include analysing public health data, laboratory-based practical sessions and participation in a series of ‘mock’ medical scenarios relating to research. Throughout the week, participants will be encouraged to think about the various ethical and social issues relating to health research such as how we should set research priorities, what makes someone choose to take part in a research study as a subject and when it is and is not ethical to perform research using human participants. At the end of the week, participants will be given time to prepare a presentation on what they have done to friends and family at a final celebration of the week. For photos of last year’s events please scroll down! The summer school will take place Monday 1st August to Friday 5th August 2016. The summer school is not residential and days will last from approximately 10am until 4.30pm. Financial support for travel will be provided where necessary and lunch will be provided each day. Applications are now open. To apply please complete this online Survey Monkey Application. Students will be expected to apply using the online application form above. The form requires basic contact information and then asks for two extended answers (250 or 500 words) to more general questions. Answers to these questions will be used to assess candidates and candidates are advised to take their time in answering these questions. The review panel will be looking for answers that demonstrate candidate potential and interest in research. Although candidates should check that answers are understandable, reviewers will be more interested in content of answers than style. Please note there is no way of saving answers on the form so students are advised to write out answers to essay questions in a text editor such as Microsoft Word and then copy and paste answers when happy. Candidates are also asked to submit the name of a teacher at their school who can provide a statement of support for them. At a minimum, teachers will be asked to confirm that the candidate is a student at the school with the required predicted grades. Teachers will also be invited to provide a written statement of support and outline any factors that they feel the review panel should be aware of when making their decisions. A link will be sent directly to the teacher to complete their section of the survey once the application form has been submitted by student. The closing date for applications from students is 14 July. Successful applicants will be informed by 20 July. Below are some issues to think about when answering the extended questions. This guidance is not meant to be restrictive and the review panel will be examining applications based on candidate potential rather than ability to address all points in this guidance. However, the comments are meant to guide students in thinking about their answers. Of note, the word limits are maximum word limits and answers will be judged on content rather than length. However, we expect that applicants would answer questions fully and believe it is unlikely that candidates will be able to convey their full potential in answers of fewer than half of the maximum word limit for the question. Guidance: Remember that this summer school is focused around the different ways in which research can be conducted. Why are you interested in research? Is it something you are considering as a career? What areas are you interested in? How do you think participation in this summer school would help you achieve your goals? Guidance: We are not expecting lots of technical detail in your answer to this question. We are more interested in the research question you would ask and why you would ask it. Remember that health research is a very broad area – as long at the question relates in some way to understanding or improving people’s health then it is a relevant answer to this question. Give an example of a piece of research in the news that you have found interesting and explain why? Guidance: Candidates do not have to give an answer related to health or biomedical research. We are interested in the candidate’s general interest in research. Did you find the methods used interesting, or maybe you were surprised by the result? If you have any questions about the application process or want further details on the research summer school then please contact Jenny Cook. Does dipping a locust in gold make it taste better? 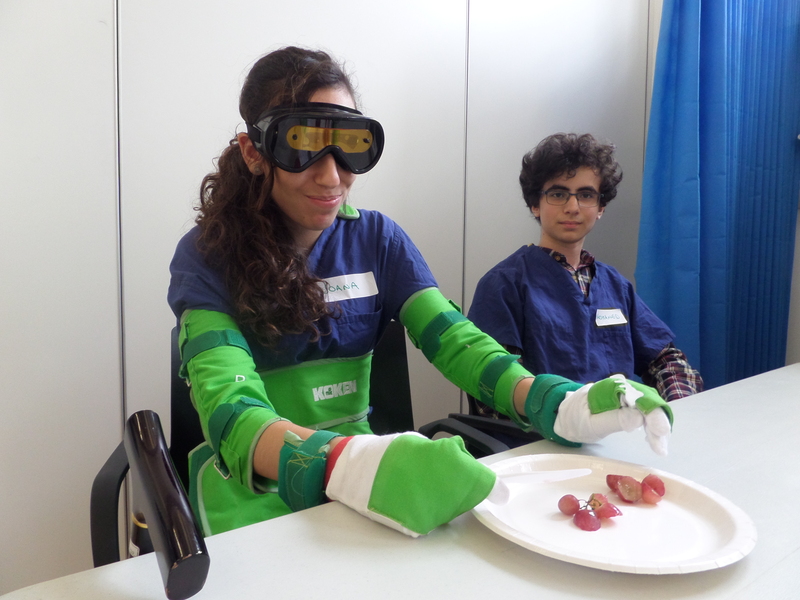 Our Monday activity workshop was hosted by Flavour SenseNation, Bug Shack and Dr Daniel Glaser – a Neuroscientist who is also the Director of the Science Gallery London – as the students learnt about the role the senses play in our perception and experience of flavours and foods. 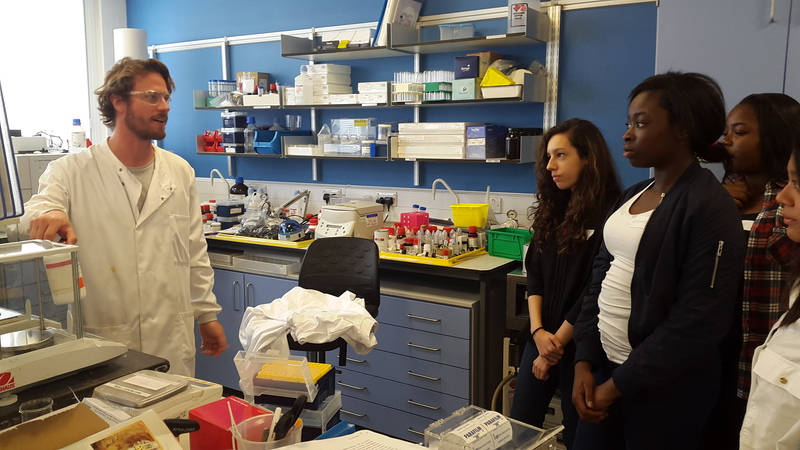 With star appearances from Zion and Tegan talking about what they discovered and why they are considering careers in Biomedical Sciences. Opportunities to get involved with research at the Biomedical Research Centre! We at the Biomedical Research Centre at Guy’s and St Thomas NHS Foundation Trust and King’s College London believe strongly in involving patients and the public in our research. We would like to create a Student’s Research Involvement Group to come and meet here at the Biomedical Research Centre with the researchers and work together to improve research design, implementation and our Public Engagement Strategy. I hope you had fun at the Summer School last week. I’m writing to ask you if you’d be interested in a new project we’re putting together. We want to start a Student Patient and Public Involvement Group, with you guys as members of the panel. We would love to be able to improve translational research for young people, and to do that we need your input understand what you would like. Translational Research is translating lab research into new clinical projects that become exciting to the medical community. We want to give a fresh face to biomedical research, and shake it up a bit, which is where you guys come in! We want to create new projects that will help young people, and in order to do that we need to know what you want to research – and what you think we should turn that research into. Members of the panel will meet roughly every three months to discuss research projects, learn more about research that is going on in the BRC, and to give feedback and generate ideas. We want to be able to shape research to help young people, and in order to do that we need you. Today the students spent the morning working on their presentations for the debate topics chosen by us. They were split into 5 groups of 3-4 and worked with some of our fantastic Biomedical Research Centre PhD student and post-doc volunteers Ashley, Jon, Vicky, Rosie and Louise. 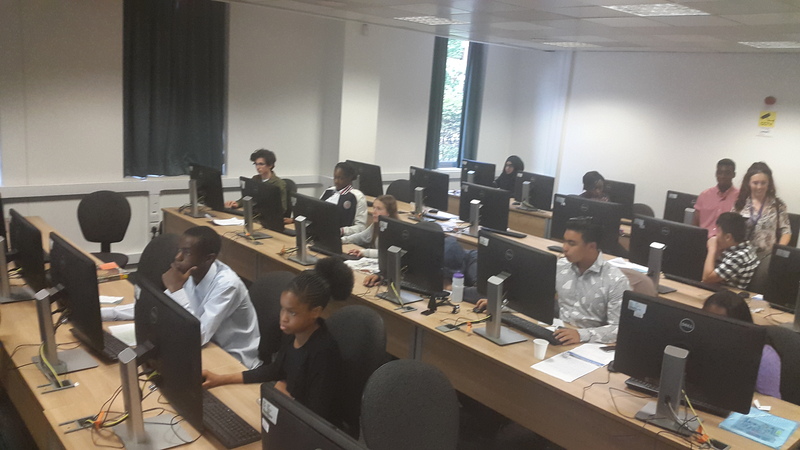 They worked in the computer lab with other KCL students quietly to create their presentations in New Hunt’s House on the King’s College site at Guy’s Campus London Bridge. 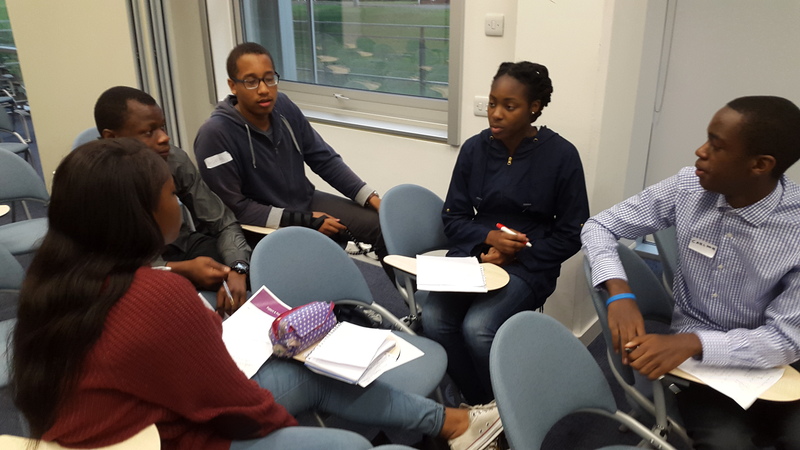 The debate topics were chosen by us to reflect issues around current issues in biomedical science to represent research being done here at the Biomedical Research Centre at Guys and St Thomas NHS Foundation Trust. 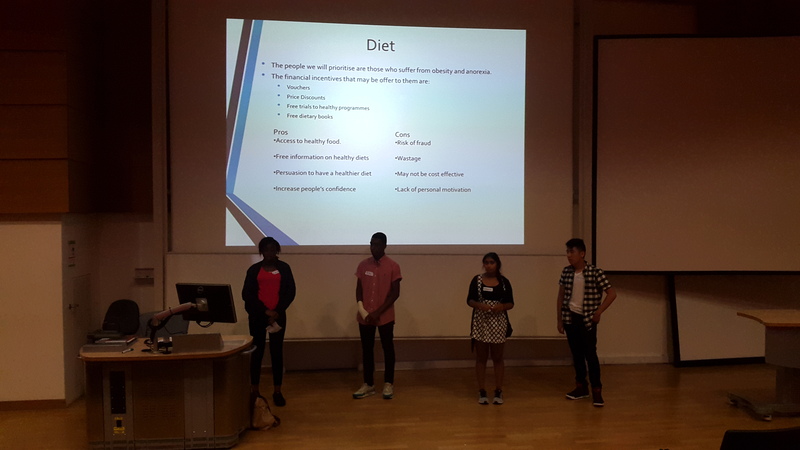 The topics ranged from using anonymised health records from GP services (our collaborations with Lambeth Public Health and Clinical Commissioning Group in the BRC Population Sciences cluster) to identifying new treatments to prevent diabetes (BRC Infection and Immunity Programme). The students worked hard all morning to create powerpoint presentations to be presented in the afternoon in front of each other and our special guest judges, Dr, Steve Thompson from Immunology, Jacintha McGahon our Biomedical Research Centre Patient and Public Involvement Manager and Dr Ruth Wan a pharmacist working here at the Trust. Family and friends were also invited along for the afternoon session and encouraged to ask questions and get involved with the discussion. After lunch the students were able to practice in the lecture theatre and none of them sounded as nervous as they said they felt! In the afternoon parents and brothers and sisters arrived for the presentations. We started off the afternoon with a big Thank you to all the volunteers and the students for attending. Each group faced the panel of judges and the questions of their peers face on – some of the questions were very tricky but each student stood their ground even in spite of some differing opinions. Prizes were awarded for best delivery and the use of visual aids, best scientific content and overall presentation. 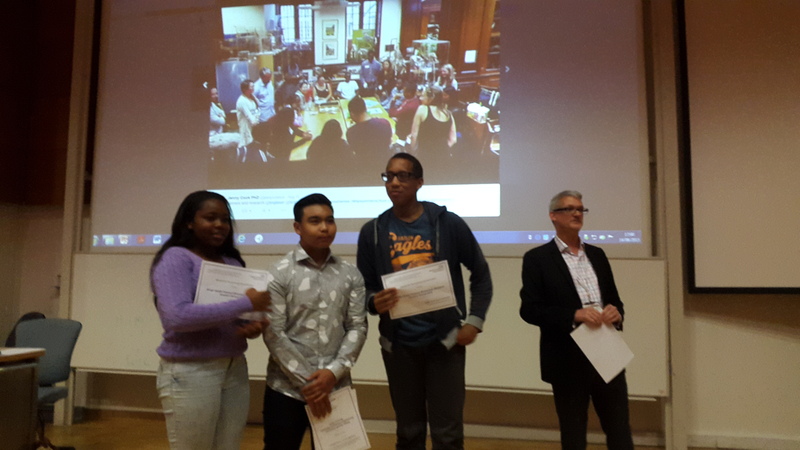 The judges found it hard to choose the winners as each presentation had its merits, but they decided Group 2, Zion, Temi and Andreas gave a fantastic presentation and worked very well together. Each student received participation certificates and we had a slideshow of some of the best images from the week! 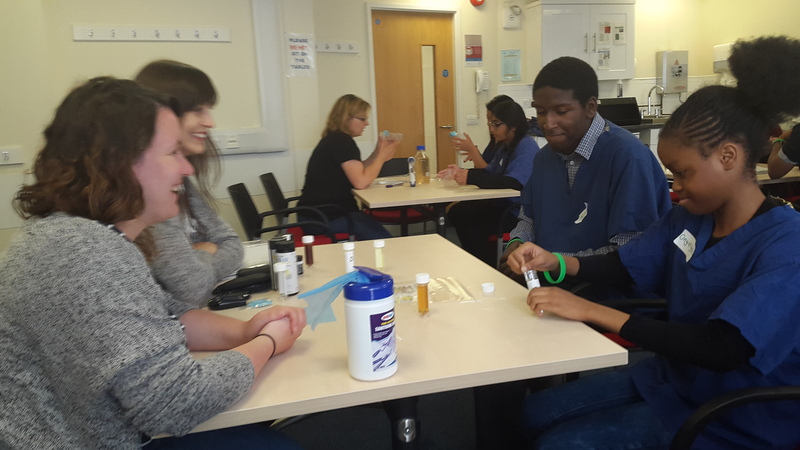 We had a fantastic time hosting the students and across King’s Health Partners, the Biomedical Research Centre at Guy’s and St Thomas’ NHS Foundation Trusts, the South London and the Maudsley Hospital and the Science Gallery London we would like to Thank the students for coming and support them in their future career choices in Biomedical Research! Today’s sessions were a change from the practical activities of the rest of the week. It was based at the South London and the Maudsley, which is a large teaching hospital in South East London specialising in psychological and psychiatric illnesses. 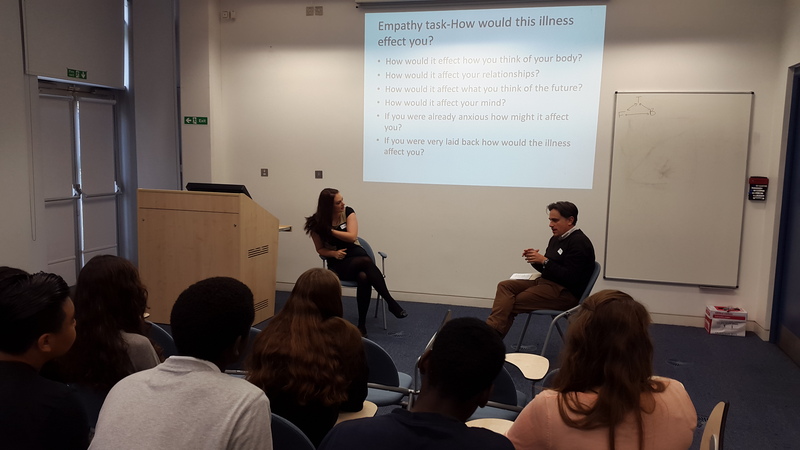 The students arrived early at in Denmark Hill and the theme for the day was diabetes and mental health.The students were hosted in the morning by Dr Chris Garrett, a clinical psychiatrist and Medical Student Megan from King’s College. Joining them was Sarah, a young patient with diabetes. The session opened with an introduction to diabetes physiology, symptoms, treatments and research into how having diabetes might affect a patient psychologically on a day to day basis. They discussed regular insulin taking, carbohydrate counting and complications, which worked well with what they learnt on Tuesday at the SaIL centre with the diabetic ketoacidosis (DKA) scenario! Dr Garrett invited one of his younger patients into the session to interview her about her personal experience of being diagnosed with diabetes age 24. She gave a wonderful account of how she came to understand her condition, even though it was very hard for her initially. 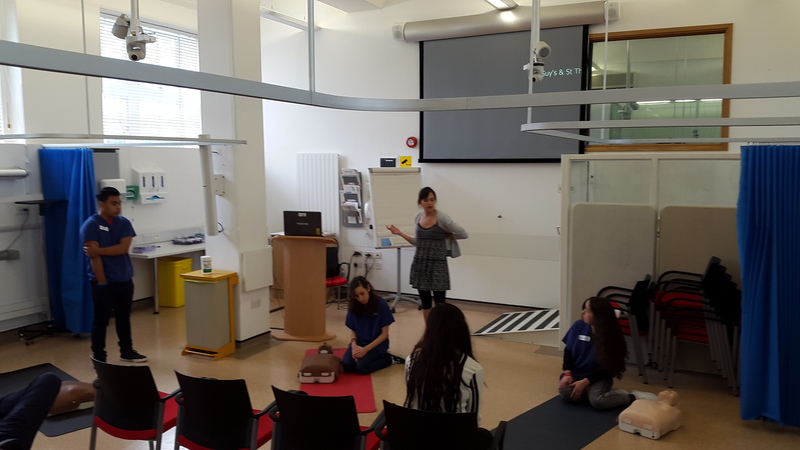 She gave them an amazing perspective of her first hand experience which really supported everything they had learnt from a medical perspective. Sarah is now happy, with a young baby and owns her own company so she was an excellent example of how therapy to understand emotional reactions can complement medical treatments. Her refreshing humour really resonated with the students and kept them engaged. After a quick break, the students were faced with a patient scenario around a first year university student and her fight to manage her diabetes away from home and her family. They brainstormed different approaches to help the patient avoid recurrent DKA hospital visits. The groups then fedback to each other and compared notes. In the afternoon, Dr Jenny Cook a researcher from King’s College London talked about the importance of engaging with the public to promote trust and understanding and the responsibility of researchers to communicate their research properly. 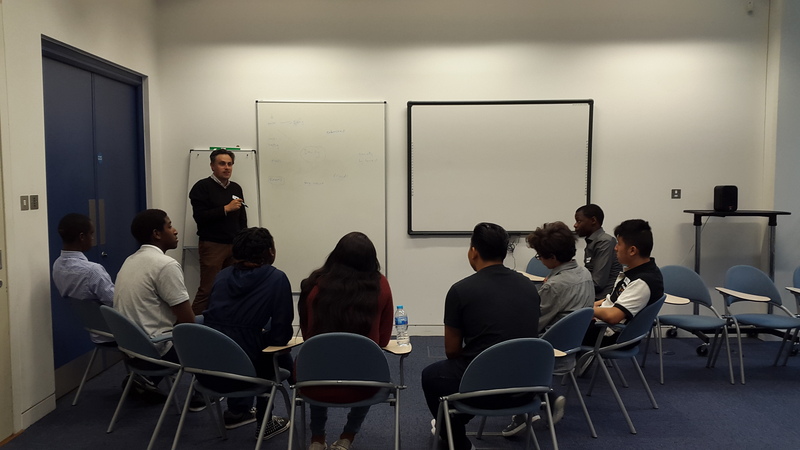 This concluded with a short workshop on communication skills in preparation for the end of week presentations tomorrow. To put this into practice, the theme of diabetes and mental health was continued into thinking about Public Health. 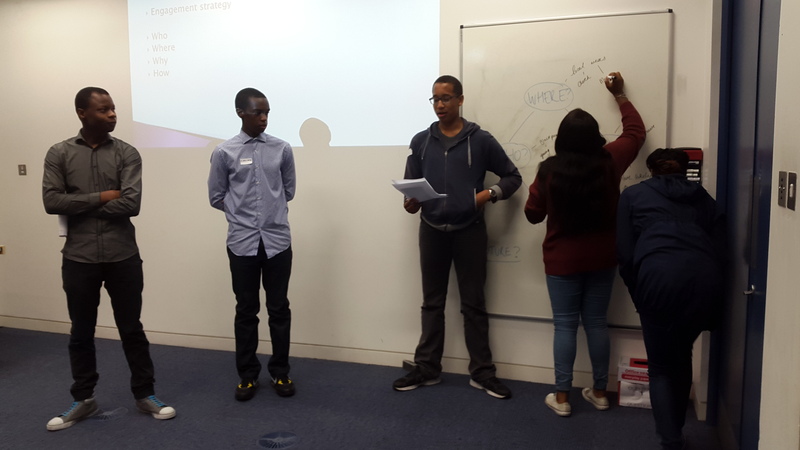 The students acted as public health professionals to think about what factors might influence diabetes and mental health prevalence in Lambeth. 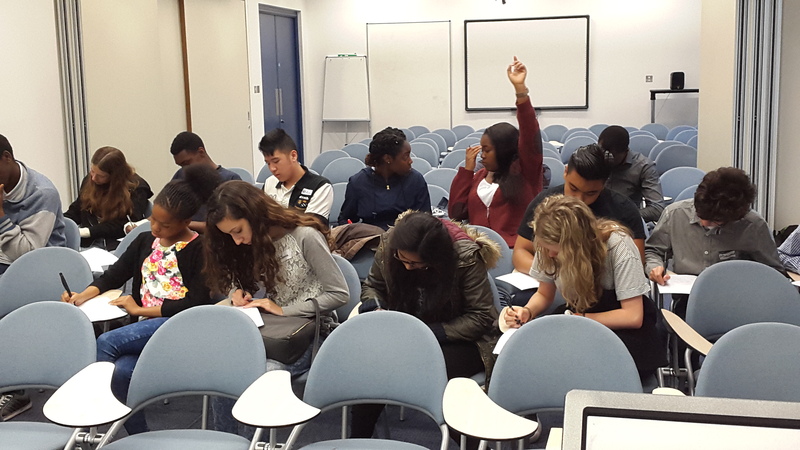 The students discussed using anonymised data from GP surgeries, it would be possible to understand whether there is an association or correlation between the conditions. Sharing anonymised data was discussed as a debate topic to understand the risks and benefits of data sharing for research. It was decided that using anonymised health records to understand a population is very useful to improve public health and services as long as it is kept secure and only accessible to the right people. The students then devised community engagement strategies to promote health information sharing. Using mental health and diabetes as an example they split into three groups to decide who they would engage with in Lambeth and why, how they would do this, how they might evaluate the effectiveness of their engagement and what the ideal outcomes would be. 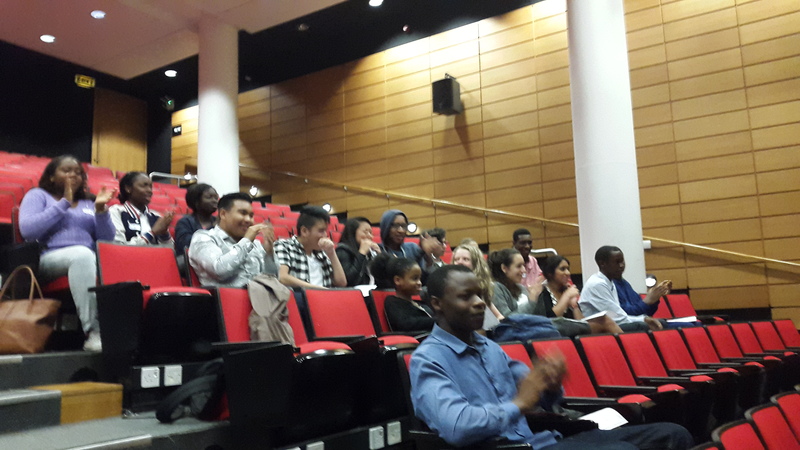 The students stood up and presented their strategies back to the other groups and they had very diverse ideas spanning different ages, ethnicities and communication techniques. We would like to offer a huge thank you to Dr Chris, Megan and Sarah for coming along and speaking to the students today! Day 3 – Visiting the Imaging Department at Kings College London St Thomas’ Hospital site – robots, brains, hearts and strawberries! Today we visited the Imaging Department at Kings College London at St Thomas’ Hospital. 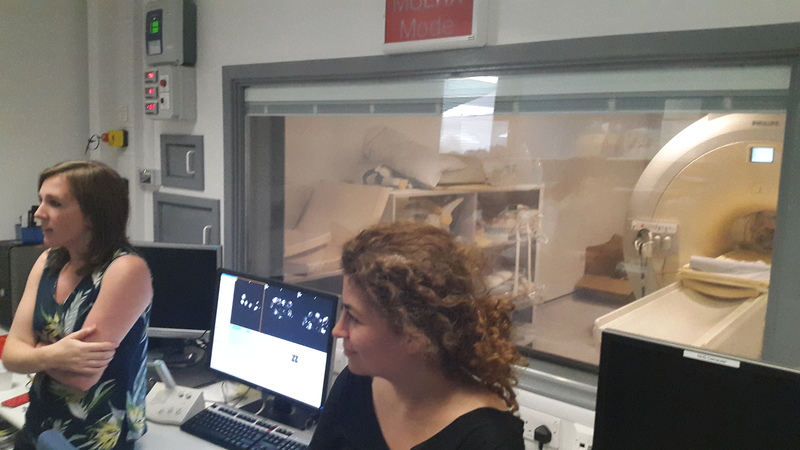 The Research Engagement and Communications manager Alice, did a fantastic job at lining up different activities to showcase a diverse range of imaging modalities and lab techniques. 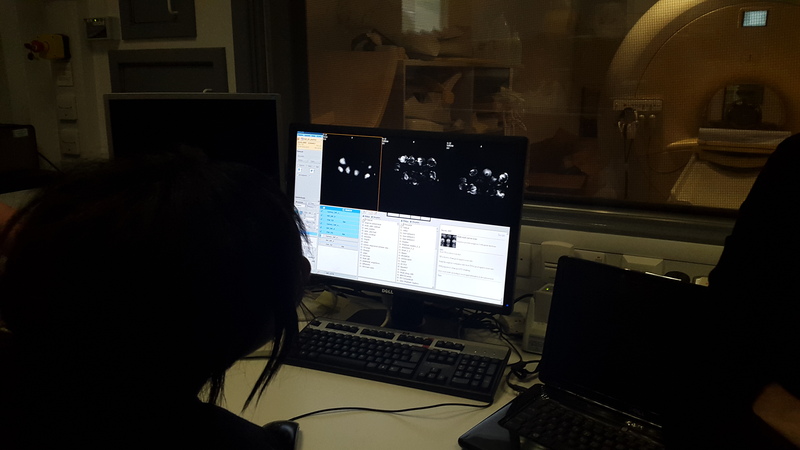 The King’s Imaging department is very engaged and lots of the researchers are working to communicate their research and inspire young people. More information about their engagement and research can be found at the Kings Imaging Blog and on the @KingsImaging twitter account. In the morning the students were introduced to members of the Imaging division and their research project and outcomes with presentations. We met Dr Chris Klein who works on perinatal brain imaging using a technique that can visualise diffusion to define the edges of neurones and map them. 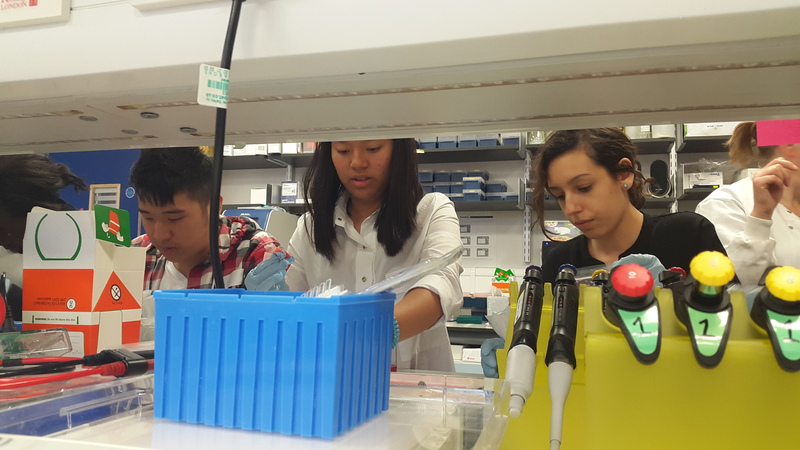 In order to understand more about the cellular changes that can take place under hypoxic conditions due to brain injury in pre-term infants, Claire and Anna from the perinatal lab talked about understanding cellular changes by extracting and examining DNA. 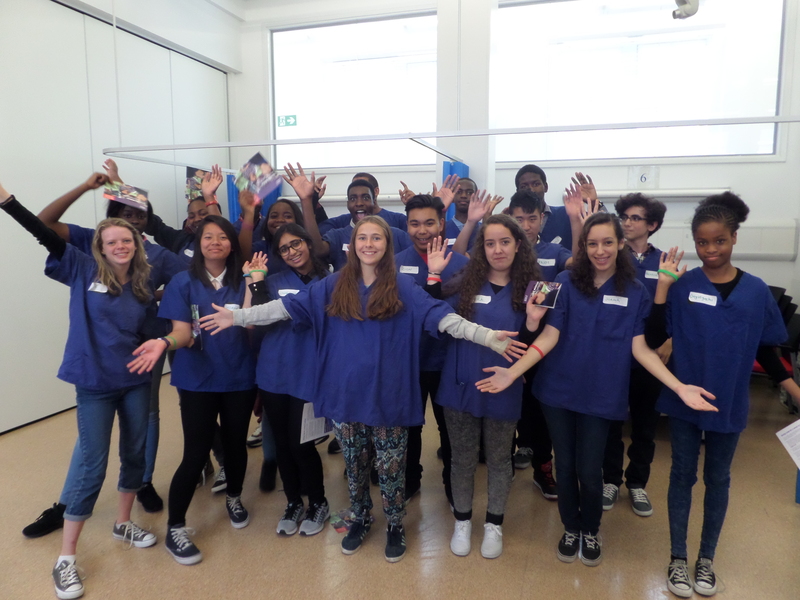 Today the students attended the Simulation and Interactive Learning Centre at St Thomas’ Hospital to work with the Hands up for Health Team. This centre is used to train medical students, paramedics and surgeons in the hospital. 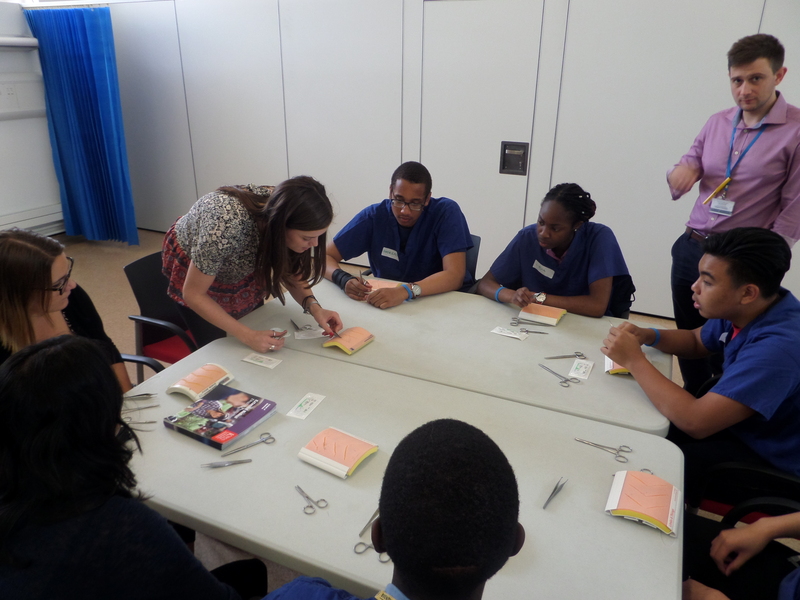 This was a great opportunity to get a taster of life in the NHS and learn about lots of different careers. 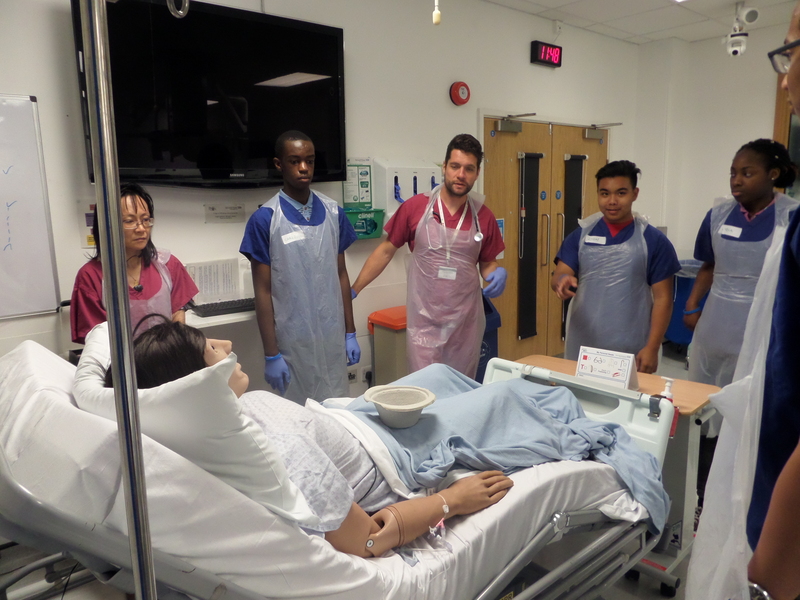 In the morning, PhD students from the Biomedical Research Centre ran several different clinical scientist demonstrations that are commonly used within the hospital. Th e students were able to diagnose common diseases associated with the kidneys by working with dipsticks to assess concentrations of various substances in the urine. The importance of hand washing and sterile technique was discussed using a UV lightbox and UV gel to indicate how to wash hands properly. Aseptic technique and cell culture was demonstrated with culture flasks and pipettes and this application into clinical science and adoptive cell transfer. Peak flow measures and our famous lung models were used to discuss the effects of asthma and smoking on the lungs. 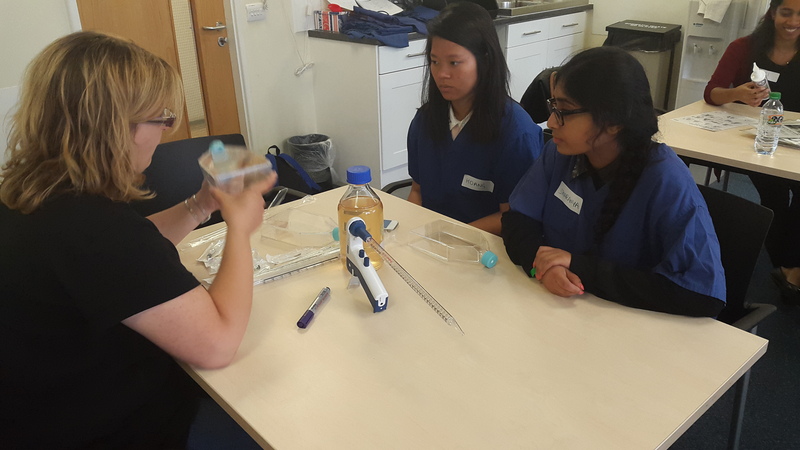 Another science demonstration was based around blood glucose testing and diabetes and this was linked to a clinical demonstration where one of our manikins suffered from diabetic ketoacidosis after drinking too much at a party and hiding their condition. 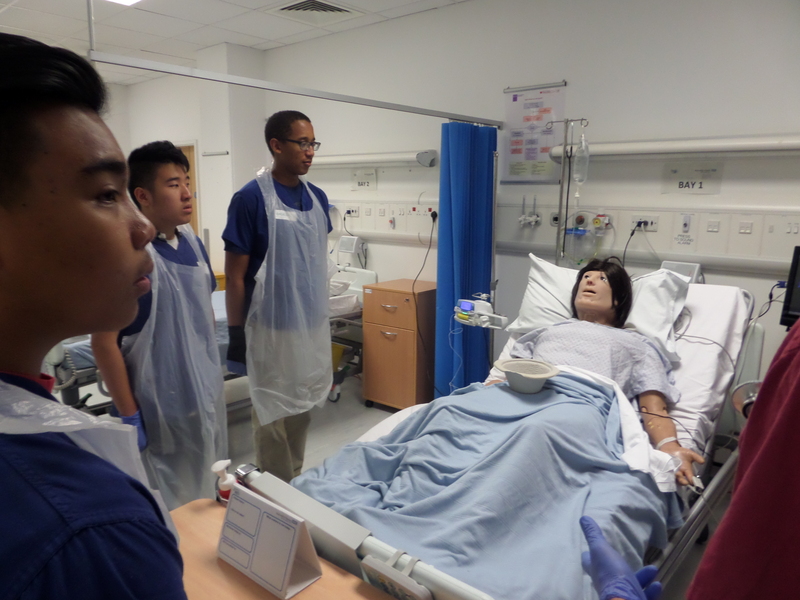 The students were able to stabilise the patient by asking the patient the correct questions and adminstering insulin. 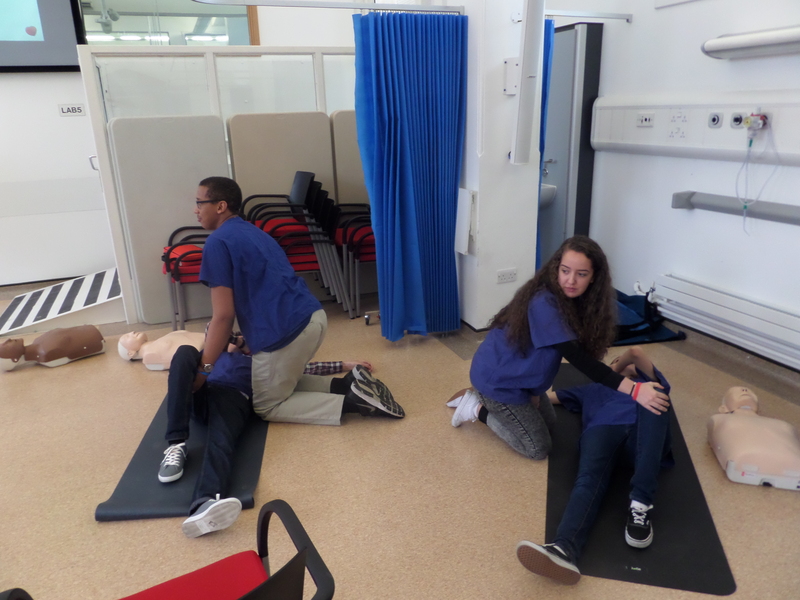 Resuscitation on manikins – staying alive! 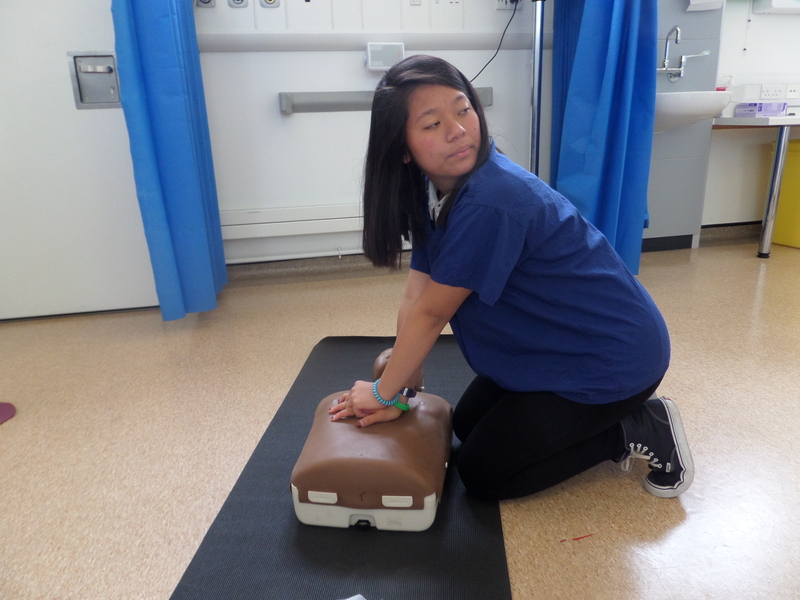 The morning session hosted by Dr Beth provided a brief introduction to life support skills, she showed the students what to think about in an emergency situation and how to carry out resuscitation and put each other into a recovery position! In the afternoon, the students got to try their hands at several other activities. 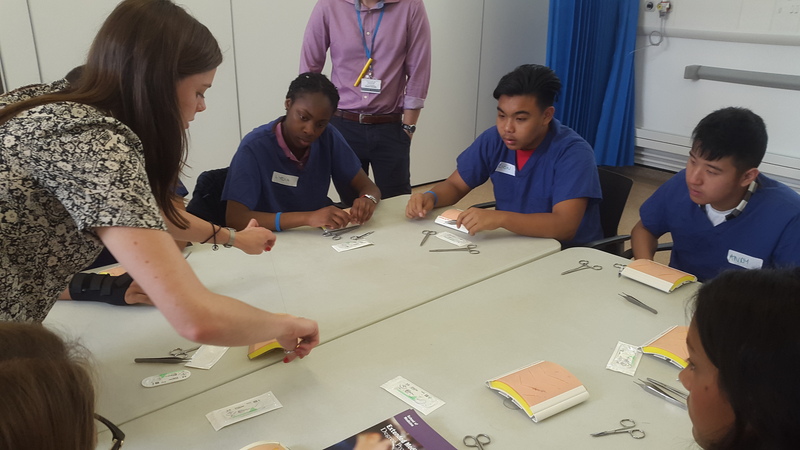 Working with Laura Ingham and the Outreach for Medicine team, the students were able to learn how to take blood pressure and blood from model patients and suture wounds! On the wards, one of our patients goes into emergency cardiac arrest and the students were able to diagnose and stabilise him. This was a very high pressure environment and the students were fantastic under stress! To get a better understanding of working with older people and their carers, the students were able to experience what it might be like to age. Using physical mobility suits they faced trying to use a knife and fork and getting up and down the stairs. From the other side, their friends acted as carers and learnt about some of the frustrations that can be faced when looking after someone who is less able. In the seminar room, Dr Cheryl Gillett and her team of public representatives taught the students about taking consent and what to consider – the students were pitched up against the volunteers who take consent in the breast clinic posing as patients to gain their consent to take place on a trial. The students all agreed that they have had a great fun day and the opportunities to learn are like nothing they have done before. 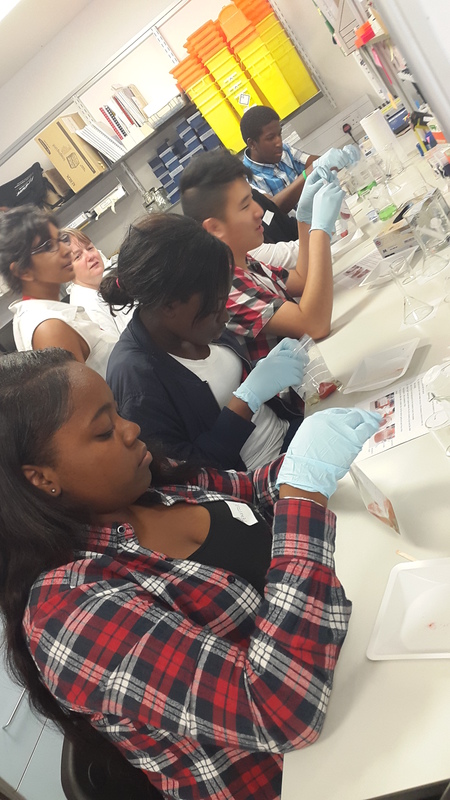 “Whilst at summer school, I was exposed to different careers in science and different aspects of biomedical research. I engaged in a lot of practical work, including treating and diagnosing dummy pacients, taking someone’s blood pressure, taking blood samples and also learning CPR. I was also present in lectures that taught me about imaging used in medicine, for example, x-rays and MRI scans. 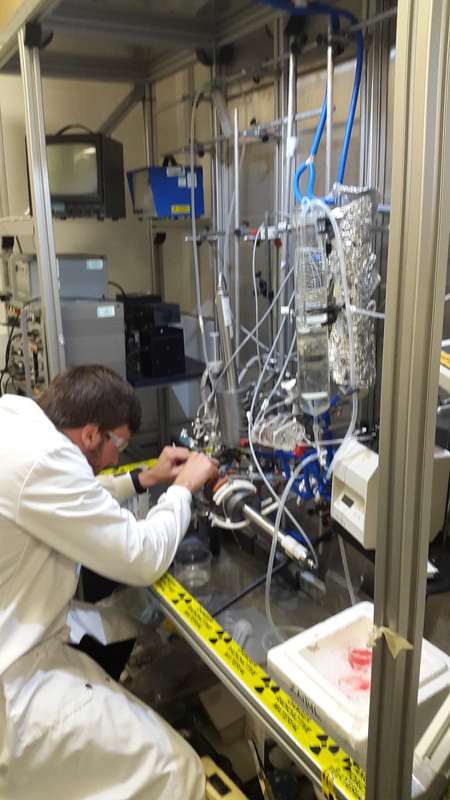 A HUGE THANK YOU to everyone at the Simulation and Interactive Learning Centre for hosting us today and to all the PhD students and post-docs who gave us their valuable laboratory time to help out with the demonstrations as volunteers. We are looking forward to meeting Alice Taylor-Gee and everyone in the King’s Imaging department tomorrow morning!